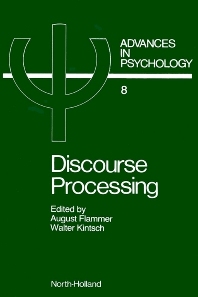 Research on discourse (or text) processing has only recently come into its own. It builds on the work of text analysis which has a long and distinguished history, but modern developments in psychology (e.g. memory research), artificial intelligence, linguistics and philosophy have contributed to this emergence in the last decade as a lively and promising research area. This book contains 46 selected and edited contributions from the International Symposium held in Fribourg in 1981, and represents a truly international overview of the developments in research on written and oral discourse. The contributions have been grouped according to problem area and not according to methodology, with the intention of focusing on the important issues in the field of discourse processing and of showing how diverse approaches contribute to a better understanding of the problems involved. The main themes are: text structure, coherence, inference, memory processes, attention and control, goal perspectives, and educational implications.